Hover over a block for a brief insight, click to dig deeper. There is a well-established inextricable link between the effectiveness of a company’s go-to-market capabilities (marketing + sales + selling) and the performance of the business as a whole. Your go-to-market model requires a blend of strategy and tactics, just like a chess game. Gaps or weaknesses in your game plan will damage your ability to deliver optimal results in terms of; new customers, new business, repeat business, referrals, recommendations, growth and profit. So if you ultimately wish to improve your business performance, looking at your sales & marketing effectiveness is a good first step. Click on any of the satellite hexagons above to learn more on specific aspects reflecting your immediate concerns. Each company is unique, as are its needs and wants in terms of what the business is expected to achieve and deliver to the shareholders. While the needs and wants are unique, the issues that companies encounter on their journey often follow familiar patterns. 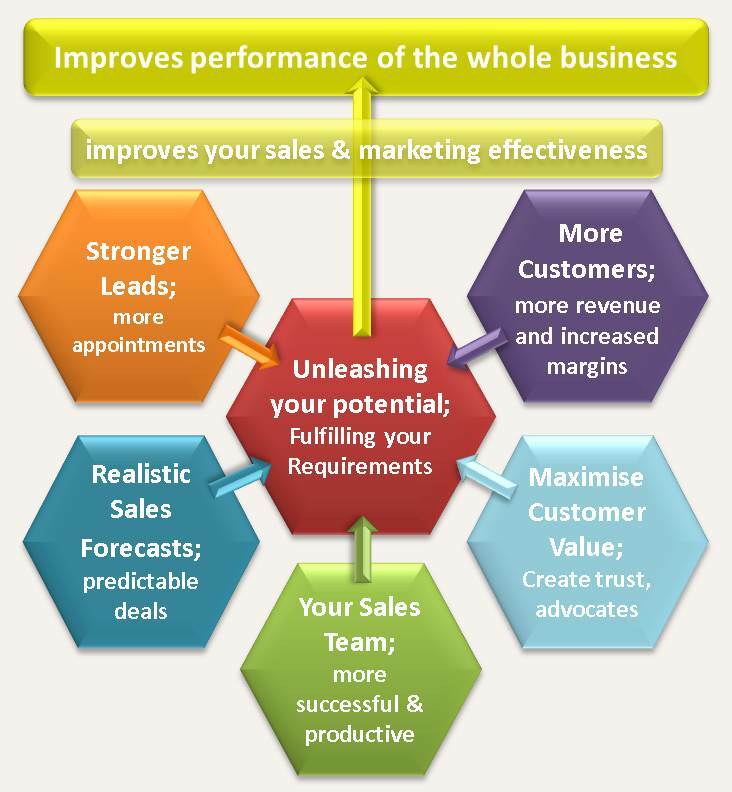 So, in the context of sales performance and productivity improvement what’s holding you back? Reporting; sales forecasts you cannot trust; decision date, deal value, how the decision will go, what the competition might do, etc. These are typical symptoms which if treated individually can only provide a short-term tactical fix. Like a chess game, you can react to the latest move, but sometimes you need to recognise tactics and play the long game. To bring about sustainable performance improvement first requires identification of the underlying causes driving the symptoms, followed by the formulation and implementation of a strategy that addresses the whole problem; meeting your needs, your priorities, within your budget, to unleash your potential. so why not get in touch for a no obligation confidential discussion?